Whether you are meeting with someone one-on-one, or presenting to an auditorium, I've created these slide decks to help you communicate CCL's message to the higher ed audience. Click on the images below to download the presentations. This presentation is for introducing students and others in higher ed to CCL. It includes an overview of carbon fee and dividend, CCL, and how students can get involved. This presentation is a simple overview of the science behind climate change, its potential consequences, and potential solutions. This presentation is for those already familiar with CCL interested in learning how to get involved in higher ed outreach. This presentation is for Presidents and administrators considering an endorsement on carbon pricing. 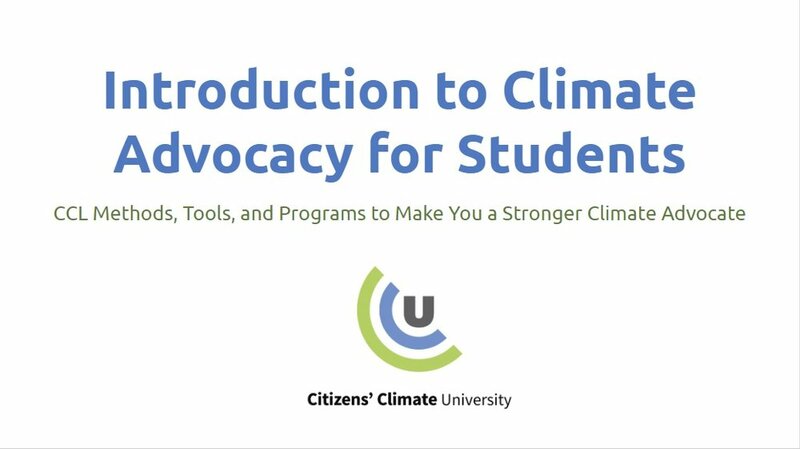 This presentation outlines different methods, tools, and programs that CCL has to make you a stronger climate advocate. From letter writing to lobbying, you will gain the knowledge and skills you need to create political will for a livable world. You can request someone from CCL’s Speaker’s Bureau to speak at your event. These high level speakers are available for keynotes and presentations to large audiences. They are able to not only speak about CCL, but also about their areas of expertise. You will need to reimburse them for travel and possibly offer an honorarium. Availability is dependent upon request. You can request a member of CCL’s presenter’s action team to give a presentation. Any group, club, or organization with five or more members can request a free in-person presentation that will briefly explain today’s climate facts, and a simple, fair, and broadly supported solution. Our presenter will not only educate your group, but also inspire them with a solution and empower them to take action. Fill out this form to request a presenter.